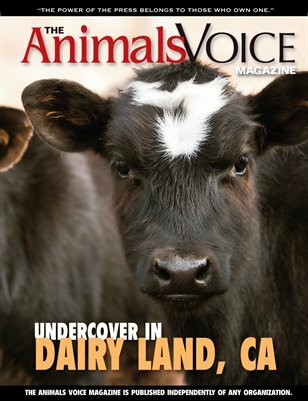 This issue's cover story is about an undercover experience at a Southern California dairy and auction yard. Other features are military dog post traumatic stress disorder, an interview with White Coat Waste Project's Anthony Bellotti, and a look inside the angora rabbit fur industry. News includes articles about farmed animal abuse, China's animal welfare movement, Nepal's tigers, endangered manatees, and wild horses.